The arrest this morning of Raul Hernandez, 14, signals that school and sheriff’s officials will be taking a hard stand against any threats, however un-serious the intention. Matanzas High’s law and justice academy, developed by students with help from the sheriff’s office and others, mirrors the popular fire academy at Flagler Palm Coast High School. A legislatively chartered organization granted FPC and Matanzas $22,000 for the vocational program through the Flagler Education Foundation. A Snapchat threat to a school in Virginia with the same acronym as Matanzas High School in Palm Coast drew many calls to the sheriff’s office Sunday. Battery charges were forwarded to the State Attorney’s Office against several Matanzas High girls following a series of fights that stretched over several days and locations. 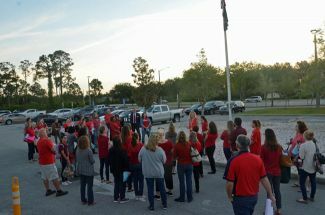 A Matanzas High School student’s fabrication of a gun sighting on campus around noon today led to a localized lockdown in the school’s parking lot, car searches and a lot of police activity on campus. Anna Crawford had been assistant principal at Flagler Palm Coast High School and Belle Terre Elementary, Jeff Reaves is a Volusia County import.